The service processor network management port is labeled NET MGT. This port is located just to the right of the serial management (SER MGT) port on the rear panel. 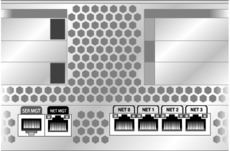 Connect a Category 5 cable from the NET MGT network management port to your network switch or hub. Note - This port is not operational until you configure the network settings (through the serial management port), as detailed in Configure the Service Processor Network Management Port. Note - If you have access to a DHCP server on the network, you can see the service processor get an IP address because the DHCP client is enabled by default. Note - The service processor network management port is configured by default to retrieve network settings with Dynamic Host Configuration Protocol (DHCP) and allow connections using Solaris Secure Shell (SSH). You might need to modify these settings for your network. Instructions are given in Powering On the System.